TIMELESS DESIGN FOR OPTIMAL FUN ON THE WATER! The CLASSIC wakeboard, originally designed by Shawn Watson, is back for 2016 and continues to prove that some wakeboard designs are too good to go away. Most of our top riders have ridden this board at some point in their careers while progressing up the ranks. Built and designed for optimal fun on the water, the CLASSIC has a performance feel yet offers a bit of forgiveness on the wake for learning new tricks. Equipped with a 3-Stage Rocker that provides solid pop off the wake and a Lifted Variable Edge Rail that gives you optimal response and control, this board is extremely user friendly. Break in rocker curve for aggressive riding style - Flatter center curve for speed & rail control - Exaggerated exit angle through tip gives a bucking pop off wake. Its so freeing to be single, and its super stable when riding flat. Smooth edged fins without the hassle of hardware. Increased acceleration and pop while maintaining soft landings. These boards are designed and created specifically to provide you with the most enjoyment behind your boat! 51.4 130.4 cm. 16.4 41.7 cm. 2.2 5.6 cm. 20.0" - 24.0" 50.8 - 61.0 cm. 70 - 140 lbs 32 - 64 kg. 52.8 134.2 cm. 16.9 42.9 cm. 2.3 5.8 cm. 21.0" - 25.0" 53.3 - 63.5 cm. 90-170 lbs 40 - 77 kg. 54.4 138.3 cm. 17.3 43.9 cm. 2.4 6.1 cm. 22.0" - 26.0" 55.9 - 66.0 cm. 130 - 210 lbs 60 - 95 kg. 55.9 142.1 cm. 17.5 44.5 cm. 2.5 6.4 cm. 23.0" - 27.0" 58.4 - 68.6 cm. 160 - 240+ lbs 72 - 110+ kg. 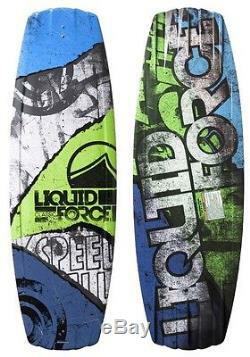 The item "Liquid Force 2016 Classic Wakeboard Only" is in sale since Wednesday, August 03, 2016. This item is in the category "Sporting Goods\Water Sports\Wakeboarding & Waterskiing\Wakeboards". The seller is "88-gear" and is located in Reedsburg, Wisconsin. This item can be shipped to United States.